Lusaka, 4th April 2018 – While we do not expect the Mast Newspaper to withdraw its lead story in their edition for today, 4th April 2018, we expect a certain level of decency even from hostile media. The Mast Newspaper, with intent to mislead the general public and thereby embarrass Hon Davies Mwila and Patriotic Front, runs with a fake screaming headline and story attributing it to PF Secretary General. The Mast Newspaper is aware that the audio and words referred to were not of Hon Mwila but someone else yet they proceeded to run a story void of truth. We demand that Mast Newspaper withdraws the said story and apologises to Hon Mwila in his capacity as Party Secretary General and the Patriotic Front at large. We want to believe there still resides some decency in the media house to acknowledge theirs was fake news and take responsibility for their own mess. We further wish the Mast Newspaper good luck in its endeavour to launder Mr. Fred M’membe especially after revealing information from Mr. Wynter Kabimba about homosexuality and atheism. Lastly, we ask the general public to dismiss a statement attributed to NDC spokesperson Eric Chanda alleging that the ruling Party has paid K300,000 and bought a car for their Lusaka Province Chairperson Goodson Banda. We have no cause for going to such lengths and depths just to fish the NDC Provincial Chairperson. If at all Cde Banda is rejoining the PF as Cde Chanda alleges, it will be because the NDC is in dire want of a clear sense of direction. Things are falling apart, not just figuratively, in the NDC and any reasonable follower would have to think twice about staying. Then don’t put their editors in jail, and don’t shut down The Post. How can this be fake news when an audio of the illiterate uncouth Davies Mwila saying exactly what is written in the Mast is circulating? “Cde Banda” says Media boss for PF, Cde Sunday. This COMRADE is back in their minds. Socialism emutande!!! Its such statements that are raising interest in the media, then ECL goes on to complain that media is focussing on pet things. Please, Mr. ECL start with your team. If they learn to argue sensibly, then the media will not be focussed on such topics. But as long as some of these st.u.pid ministers keep on addressing s.i.lly topics, Mr ECL should not blame the media. There is an audio were Davies mwila is head saying exactly just that. At least he is got a sense of truth in him to simply state the eminent arrests that will follow after 2021. Chanda you must be peeing in your pants right now because these so called media circus at PF Secretariat is in such disarray. Imagine the SG making such a statement and he has even emphasized that this is not a joking matter, its a matter between jail and continued corruption. The clock is ticking, with the impeachment in motion we might not even reach 2021. By the way were is Mumbi Phiri we head the she did some unforgivable sin? Gullible person,how do you know its Davis in the audio?Wezenko? That is what happens when you have democracy orchestrated by the West, anyone can be a president regardless of their calibre and past. Alongside democracy we need to to have other systems to prevent certain categories of people of people running for higher leadership. I do not think we have a shortage of leadership in Zambia. We simply have a rotten system that does not prevent criminals and people who are not ethically upright to lead the nation and national businesses. Yes am sure even the other audio of the same gentleman telling councillors to share plots before advertising to the public is fake news. The likes of Mwila would rather see civil war than relinquish power. And what is of more concern is that the President takes no action against this man’s unpatriotic utterances. It gives the impression that he approves or is scared of Mwila. As for Sunday Chanda….The president really needs a new PR team. Amos and Sunday are a disaster. They make him look bad. The two of them have cost PF a lot of support with their arrogant and incompetent statements. Interesting…Sunday Chanda is not demanding the newspaper apologize and withdraw fake news or face court action. This can only mean one thing – It is beyond reasonable doubt that the Davis Mwila is the audio source. CAN THE “MAST” SHOULD PRODUCE A VIDEO CLIP TO REMOVE THE ‘MIST”? 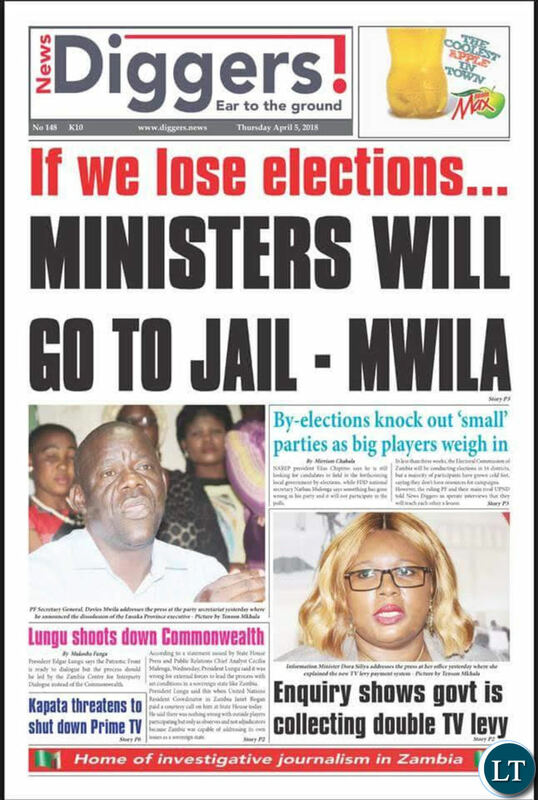 In law we say, the burden of proving Mwila’s culpability is on the MAST. It must establish that the fake news is true by including the VIDEO CLIPs. With advances in technology I can edit my voice to sound like KK or Dennis Liwewe’s. Surely going by the alleged crimes this PF president has committed, days for him move very fast. The same days may be moving very slow for HH but if I was to pick any of the 2, I would rather be in HH’s shoes. Looking forward to something that may not be given to me but atleast with no fear than living with fear of what is to come. It is not ideal for any one including ECL. Could not have put it better….well articulated..
Chomba Kalenga, your contribution beats all contributions. But u zambians. The luapula pf mobilisation meeting was shown on prime tv for almost 2hours tuesday or is it monday nite? 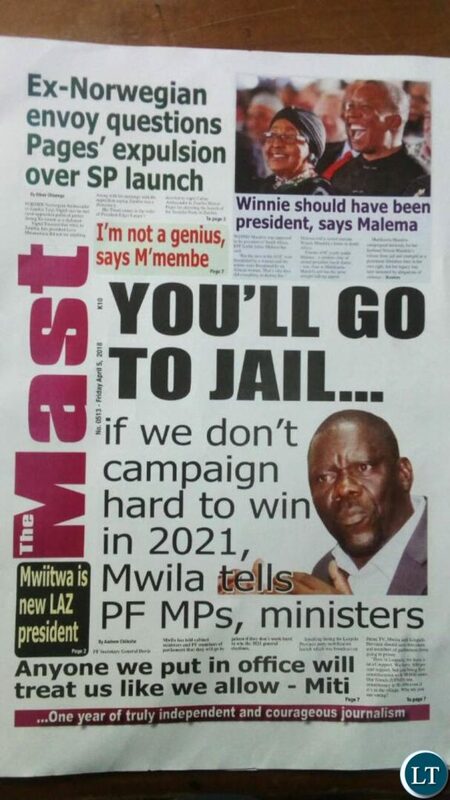 The one who warned about imprisonment of mps and ministers if pf lost elections was pf sg mwila. Even for one to suggest a denial on behalf of mwila goes to show how evil these koswes can be. Its not audio, its video. Stop watching deadznbc. Is it also a criminal offence to be an atheist in Zambia? Zambians if you have never prayed for this nation before, PRAY!This is no joke at all abena Zed, pf is not ready to relinquish power by all means and they will organise a shoddy election firstly by printing ballot papers in Zambia.They will also print even extra ballot papers to rig the elections.If the opposition takes also an uncompromising stance, then expect something worse.If you love Zambia begin to petition God for peace towards the 2021 elections. What’s the difference between Sunday Chanda and Amos Chanda? Are they related? I am just wondering how stupidity can be concentrated around one sir name. Is this just a coincidence? Forget about other people with the same sir name. I am just wondering about these two. And how is it that two people with the same sir name were chosen to be mouth pieces of the most corrupt regime to ever rule Zambia. Bembas should be very careful. Someone from Malawi is busy stealing but he has conveniently chosen two bembas to defend all his corruption. This is how the whole tribe ends up being labeled the wrong way. Believe me, this not a mere coincidence. This is a plan by a Malawian to get Bembas insulted and labeled as thieves. Hehehehe ……….. very funny and could befact, lungu puts 2 bembas to lying for him……. The MAST was written on Friday 5 April 2018. emotions!!!!!!!!!!! Yes they are very related, either their fathers are brothers or they share same parents. Look at their heads, they are both loosing hair and hopefully they lose power soon.